This has been Mariah Dunning's motto. Her compass. Her belief. So when she glimpses her mother--who's been missing and presumed dead for the past two years--on the other side of a crowded food court, Mariah's conviction becomes stronger than ever. Or is she losing her mind? Her mother disappeared without a trace and--even without a body or any physical evidence--suspicion for her murder immediately fell upon Mariah's father, leaving both father and daughter ostracized from their close-knit community. I thought that this was really good. I decided to pick this one up because I was in the mood for a good mystery and I have been wanting to read Jeff Abbott's writing. Once I started reading this book, I was hooked. I wanted to know what had happened to these three Beths and I wanted to see their families find the answers they needed. This was a mystery that turned out to be quite the page-turner. Mariah's mother has been gone a long time. Nobody has seen her and her body has not been found but Mariah knows that her mother would have never just left and despite with the community thinks, Mariah knows that her father couldn't have killed her. After Mariah sees who she thinks is her mother at the mall, she starts to do whatever she can to try to find out what actually happened. When she learns that another Beth went missing around the same time as her mother, she finds herself unraveling a mystery that is much larger than she could have expected. I liked the characters in this book. Mariah and her father have both been through so much since her mother disappeared. The town is convinced that Mariah's father is responsible for Beth's disappearance so they are dealing with the unknown, their grief, and harassment from the community. I completely understood why Mariah felt the need to try to solve this mystery on her own because the police only seemed to be interested in looking at her father. I will say that some of the things that Mariah does during her quest to find out what happened to her mother made me cringe just a bit. I thought that the mystery in this story was very well done. There were plenty of twists and turns that kept things interesting. The mystery was very complex with a lot of elements that started to fit together piece by piece as the book progressed. There were a few developments that I was able to predict but there were many surprises along the way. I was kind of surprised that the bulk of the story seemed to be focused on the second Beth but eventually everything came together. I would recommend this book to others. I found the book to be a well-plotted and complex mystery filled with plenty of twists and turns to keep the pages turning. I hope to read more from Jeff Abbott soon! 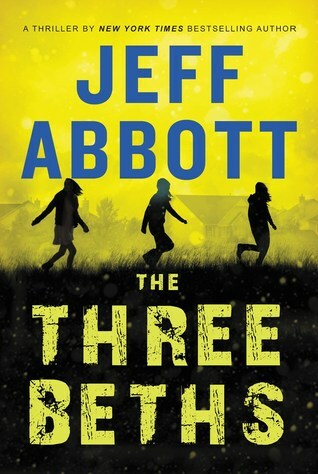 Jeff Abbott is the New York Times bestselling author of fourteen novels. He is the winner of an International Thriller Writers Award (for the Sam Capra thriller The Last Minute) and is a three-time nominee for the Edgar award. He lives in Austin with his family. I meant to read this but I kept glancing at the book you are reading now, ohh that one looks good! I liked The First Days but did have some issues with it. Sounds riveting. Thanks for sharing. Sounds like you had a good time with this one! This sounds good and it's already on my TBR - so glad. Wonderful thoughts! I hope you enjoy this one, Barb! I've been seeing good reviews for this. Might find it's way to my list. I hope you enjoy it if you do get the chance to read it. I thought it was interesting how everything came together. This one sounds interesting, now I'm curious about Mariah's mother and the three Beths. Great review Carole. Mariah's actions did make me cringe at times but I still had a good time with it. I haven't heard of this author or book before at all! Yay for good plot twists and characters that were likeable. It sounds like this one was perfect for your reading mood at the time. Oooh! This definitely has me interested! Great review!